After my retirement in 1993, my wife and I traveled extensively. We participated in a study tour through China, traveled around the world twice, and had already booked our next trip with the travel agent. Suddenly in 1997 my wife passed away. 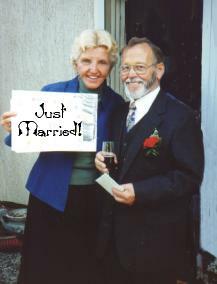 We had been married 35 years. Our children had long left the house and were living elsewhere in Germany. All at once I was alone. Good fortune came my way, when I read about Friendship Force in the local newspaper. I phoned the president of the Hanover club, who invited me to the next meeting. I was excited about the concept of traveling, hosting and being received in private homes all over the world with the purpose of getting to know other cultures. Without hesitation, I Joined. In 2001 I participated in an exchange to Mexico and Texas. While in Dallas, I met Yvonne [Klusman], originally from Holland, who had lived in the United States more than 40 years. Upon my return to Germany, I learned from my doctor that serious problems were discovered during my annual physical and he advised surgery. I phoned Yvonne to tell her the news and ask if I could come and visit. Yvonne is a chiropractor and was delighted to hear of my plans to visit. In the following 18 months, I made seven round trips to Dallas, followed Yvonne's advice on diet changes, became a vegetarian, lost some weight and now my doctor agrees that I am in excellent health. On May 5, 2003 Yvonne and I were married here in Burgdorf. Now I am 76 years old, I am very happy and continue making trips with FFI but now there are two of us. We enjoy hearing stories of other couples who have met through Friendship Force. At Christmas, we receive so much mail. That is the time that we like to keep in touch with our friends and tell each other about the experiences of the past year. Friendship Force is a unique organization. People from all parts of' the world have made lasting friendships. May this continue, and in the long run, lead to peace around the world.